Our company, DAIDOKASEI CO. LTD., was born as a reclaimed rubber manufacturing-and-selling company in 1934 (Showa 9). In our old long history, we have put our heart into development of the attractive products with the abundant individuality of additional value, with environment friendly products from original goods to OEM goods and we have been supported by our customers, the area and the society as a professional manufacturer of sheet general products. And we are making to satisfy all customers’ needs flexibly as the strength of our company such as we can consistently perform a production system from combination of plastic raw materials to sheet, forming process to the end products and by quick footwork with fine-tuned response of a small lot, a spot article and a special article. We thereby have a high evaluation in the field in many aspects. We continue having strong and firm determination to confront the challenge and strong persistence toward "manufacturing" in the future. It is our intention that a whole company forms a single unit to make "what only DAIDOKASEI CO. LTD., can do" and we will aim at the company indispensable to society. I would ask for your continuous advice and guidance in the corporate activity of our future DAIDOKASEI CO. LTD., from the bottom of my heart. Daidokasei Co. Ltd., which is loved by the local community and our customers, strives for the spirit of ingenuity, continuing to bring about the happiness of its employees and the company. Our customer preference and customer orientated philosophy thorough quality supremacy, zero defects, and compliance with our contractual obligations for speedy delivery, we aim to establish a pleasing Daido brand trusted by our highly valued customers. As a professional manufacturer of comprehensive resin products, we are active in the use of new materials and recycled products, with a view to be the sole frontrunners in the processing technology industry. In always following the creative challenging spirit, speed, motivation, innovation and the ability to execute new ideas, we continue to push ourselves to newer ideas. We try to commit ourselves for the betterment of our environment, continuing to promote actively the 3R's - Reduce (Reduce waste), Reuse (Use Again) and Recycle (recycling), and also work for the development of eco-compatible products. Continuing to secure profits towards stable management, with the aim that the company can expand along with stakeholders, we take pride and possess hope for a bright future for all. Daidokasei Co. Ltd., hereby, provides our customers with a safe, high quality product, which has earned us the trust of our valued customers. This has been achieved through our quality-controlled maintenance system, where we are constantly looking for practical ways to improve our products. By challenging ourselves to act and think from the customer's perspective, we will always continue to create valued high quality products. We review our work on a regular basis to maintain our high quality. To realize our quality policy we set quality standards and work towards their fulfillment. We move ever so quickly in good faith to the needs and requests of our customers. Combining the market environment and our customer needs, we endeavor to distribute our management resources to capital investment. In compliance with laws and all regulatory requirements, we will continue to provide safe, reliable products and reliable service. Our quality policy is ingrained in the minds and hearts of all our employees as well as is common knowledge outside our company. In Azuma Machi Higashi, Mukoujima Ward, became a member of the Japan Reclaimed Rubber Union making reclaimed rubber manufacturing and sales. In Nishinippori 2 Chome, Arakawa Ward, founded "Mito Rubber Industries" and started manufacture and sale of shoes goods using recycled rubber. In the same period joined the "Tokyo Rubber Products Union" laying organizational structure of integrated production. Joined "Tokyo Belt Union. "Undertook the manufacture and sales of shoe soles, shoes with canvas and reclaimed rubber. Site extended to Nippori 3 chome, Arakawa Ward. Procured Tokyo Ariyansu machinery and established an integrated manufacturing system for our products. Joined "Tokyo Shoe and Seamstress Union." Resumed business at Higashi Komatsugawa 3 Chome, Edogawa Ward. Joined the General Rubber Association and East Japan Rubber Industry Association to establish an integrated production system for complete rubber shoes. Joined The Japan Rubber Manufacturers Association. Extended the grounds to start a manufacturing line for bicycle tube production. Established "Tokiwa Rubber Industrial Co., Ltd." on the same site. 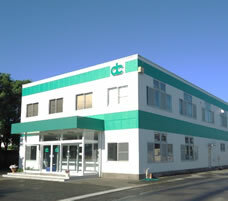 Daido Chemical Co., Ltd, a project to manufacture vinyl chloride sheets was established in Matsue 1 Chome, Edogawa Ward. Acquired: JIS · A6009 (vinyl chloride resin, synthetic polymer roofing) and Japanese Industrial Standard Display Permission "Number 38009." Construction of "Daido Chemical Chiba Plant" at Yachimata Town, Inba Gun, Chiba Prefecture with 2 lines of extra large calender facilities. In accordance with the start of Yachimata town municipal organization, our Chiba factory changed its address. New address is "Yachimata Ni 45, Yachimata-City, Chiba." Copyright 2014 Daidokasei Corp. All rights reserved.